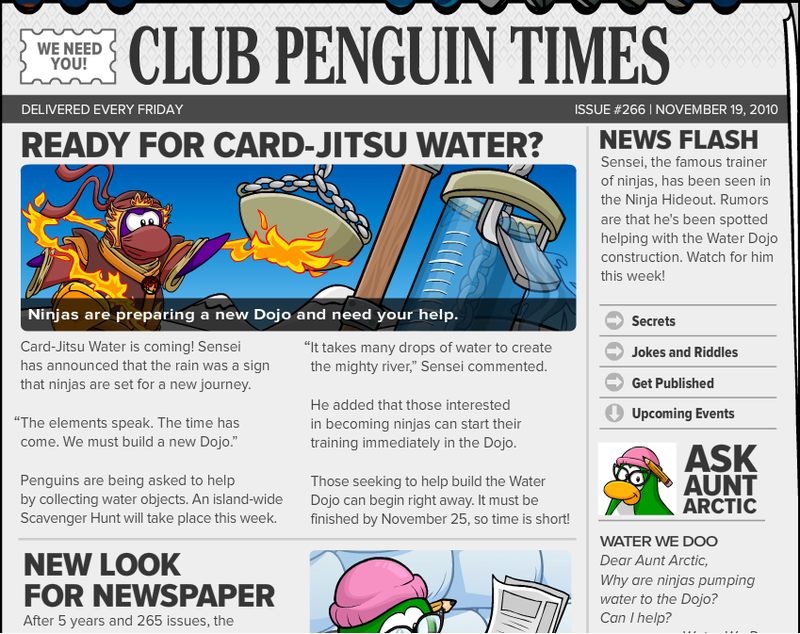 Club Penguin Cheats by Mimo777 Club Penguin Cheats by Mimo777: New News for Club Penguin Newspaper! This new 2 page newspaper is easier to read and saves "paper." It is kinda cool that you can use your arrow keys to change pages. Try it, it works! 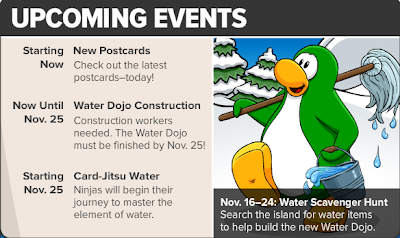 Water Dojo is under construction, and will be completed on November 25th when Card-Jitsu Water arrives. 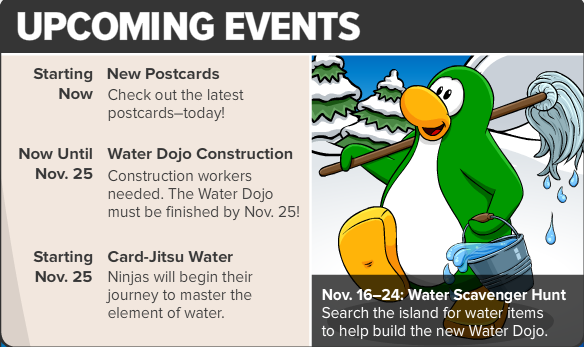 Remember, you will have to beat Sensei to earn your Water Suit! 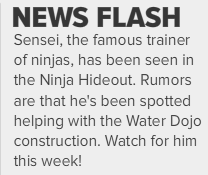 I really like the News Flash section. It will be updated with current news! Pretty smoove newspaper, don't ya think? Hmm, I wonder why it has to have 2 pages if it just scrolls down anyway! mimo i hate it it is not saweet!!!! i Want the Old news paper Back!!!! 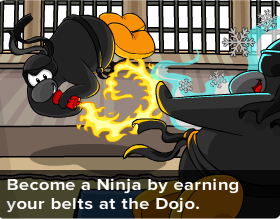 You probaly wont belive me but my joke was in Club Penguin Times! I entered my joke about 2 weeks ago and today I found it! Although my peguin name wasnt on it it was still allsome! The joke was what has holes but still holds water? The answer was a sponge. Can you ask if this has this happened to anyone else? 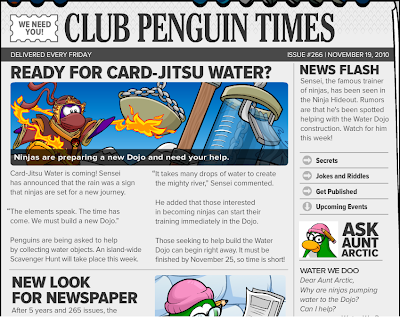 =( I miss the old newpaper!! this new newspaper is not convenient at all! and saving paper? from where? and i think the delivery should be on Thursdays so not all the new happenings are on Fridays. Its kinda cool, but slow. I recon that they should have a 'Normal view' and 'New view' of the paper. Just like how you can have big screen and small screen option to play CP. I hope that made sense lol. I don't really like the new paper. The news flash Is kind of cool but I don't like the rest of it. My computer is really old (made in 1998) and for me it takes forever to slow down. Also, since it is only two pages it's not like a real paper anymore. Congratulations on getting your joke featured! i dont like it, it doesnt even work i cant click on anything. It has two pages because if everything was in one page, it wiouldn't be a newspaper, but a tabloid. And it would be too large and contaminating, in fact, the actual newspaper is very contaminating. I really don't like the new newspaper! It's really slow,there is no comics or games and it only has two pages! I want the old one back! I love the new newspaper! I know it's kinda difficult to read, but it's awesome! MImo, whenever I exit out of the new newspaper, the screen dims and I ca't go anywhere, I just turn but don't go when I click somewhere. Answer: That has been there but its perty smoot, eh? IKR! It is awful! I used to love the news! I dont even wanna look at it anymore! maybe someone sent that in before u and u sent it in a little later. Maybe? Thats happened to me a couple times too. i hope cp fixes this! Made perfect sense! Nice idea! that would be great! I dont like it because it looks like some of those websites where they have a page for news like the blog. I dont like it at all. the comics and games and poems were the best part!!!!! Yeah its actually more paper cuz its bigger paper! Now theres no comics or anything good! You are so right. 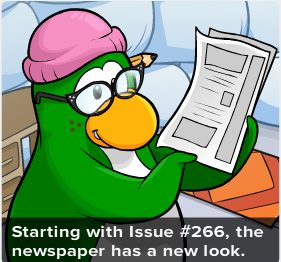 I'm kind of not impressed with the new Club Penguin newspaper. Really, no more poems, no more fan art, no more comics, and no more puzzles? I mean come on. And everything seems so Disneytized. I love the News Flash section, plus, I dont agrre with you Arikichan., I think the new newspaper is awesome! I don't like the new newspaper.... Its like only two pages.... I want the old one back!! recon that they should have a 'Normal view' and 'New view' of the paper. Just like how you can have big screen and small screen option to play CP. I hope that made sense lol. You wondered why it has two pages when you scroll, well it says in the article that it's only one page, but printed double-sided. Also, when you turn the page, it flips over, so I'm guessing it's just the one sheet with articles on both sides. mimo this newspaper is so stink itd not saweet i want old newspaper back!!!!!!!! now the paper comes on fridays so does that mean parties will start on saturday? ?